I just love a good braised pork trotter or knuckle with rice and a good soy and vinegar based sauce. Or Khao Khao Moo as this Teochew style inspired dish is named in Thailand. You find them all around town, and quite a few of them are actually ok. But that said, it’s a few miles between the ok vendors and the best vendors. 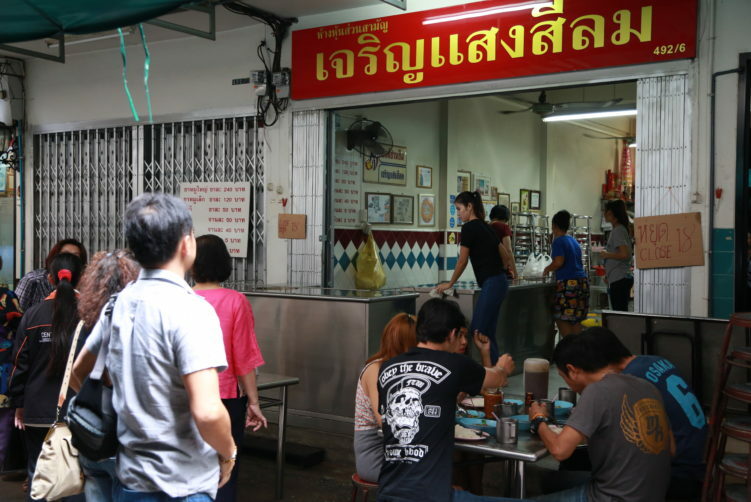 One of the great spots is Charoen Saeng Silom in Charoen Krung Soi 49. They have been in operation since 1959. And yes, you can order the entire leg. I wrote in my 4th May 2017 article that “I would be surprised if they are left out of the Michelin Guide“. 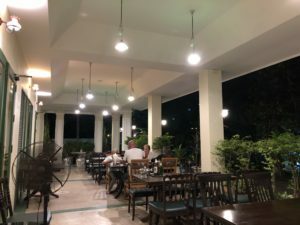 6th December 2017 the red guide gave them a Bib Gourmand. Be sure, Charoen Saeng Silom deserves it. They will not be one of those in and out of the guide vendors. Charoen Saeng Silom is there to stay. The pork meat is tender and meltingly soft, the skin is tasty without being oily or greasy, the gravy is rich and aromatic with a lot of Chinese spices and herbs in it. And most importantly, it’s not too sweet. An excellent homemade vinegar based sauce with chilies and garlic, and also pickled braised mustard greens cooked in the juice from the pork are served on the side. What more to ask for? It’s absolutely yummy for everybody that doesn’t have a cholesterol problem. If you struggle with your cholesterol, close your eyes or be light on the skin part. And yes, they are one of the few vendors left with the original Shell Shuan Shim award, overall a much better guidance than the red guide when tastes matter. The woman controlling the pans at Charoen Saeng Silom. The Shell Shuan Shim award is on the wall in the back and is recognized by the symbol of the former sponsor Shell Oil Company. The food is on display in a big metal bowl just outside the entrance. If you come as a bigger group you can order the hole leg (kha moo). The feets (Kawki) are also an option. They also have something for those on the look for intestines. Clean, tasteful and authentic. 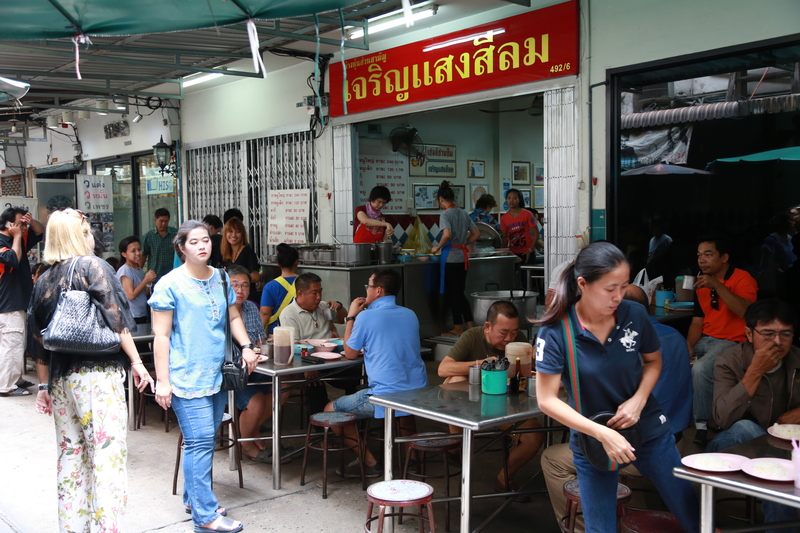 Charoen Saeng Silom have a few tables inside and quite a row outside, but you might need to wait to get seated due to it’s popularity. It also means you might have to sit down with other customers at one of the tables. They set up quite a few tables outside, but you have to be early to enjoy their services as they sell out pretty quick. Breakfast or early lunch is your best options. Another good khao kha moo spot in the area is Khao Kha Moo Trok Sung. You find the cart just outside 1455 Charoen Krung, on the corner to Soi Si Wiang. How to get there: Charoen Saeng Silom is located in Charoen Krung Soi 49. The easiest way to access it is from Silom road. When coming from BTS saphan Taksin, walk along Charoen Krung Road until you get to Muslim Restaurant. Cross the road to the other side of Charoen Krung road and walk into Silom road. Then take the first to the left (Soi 49) and walk 30 meters into the alley. You see Charoen Saeng Silom on the right side. It’s about 7-8 minutes walk from BTS to Saphan Taksin. 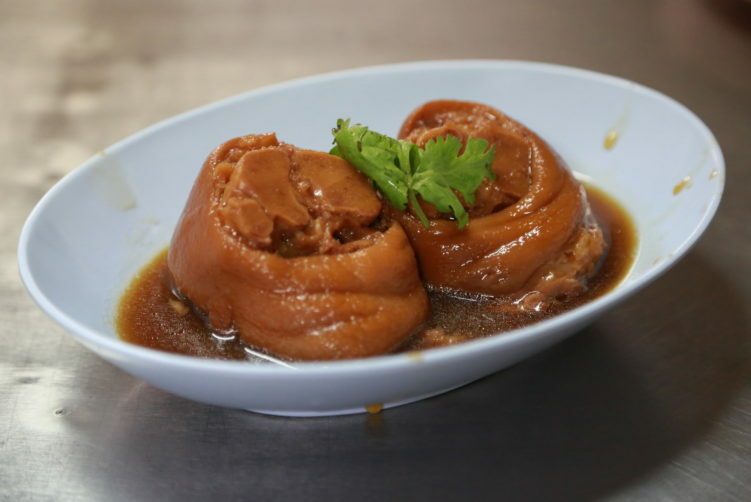 Excellent braised pork trotter or knuckle with rice and a good soy and vinegar based sauce, or Khao Khao moo as this Teochew style inspired dish is named in Thailand. See full review in StreetsideBangkok.